Thakur said the document, prepared by the government to enhance transparency will be sent back to the Centre next week with the comments of the SC collegium. He said External Affairs Minister Sushma Swaraj, who headed the Group of Ministers to draft the memorandum, had spoken with him on whether the collegium was ready with its response. CJIsaid Swaraj was abroad and the SC judges were busy with their retreat at Bhopal and the Chief Minister-Chief Justices conference. “Now she is back. We will meet her and give our comments”, he said addressing a press conference on the decisions taken at the conference of chief ministers and chief justices of high courts held here. 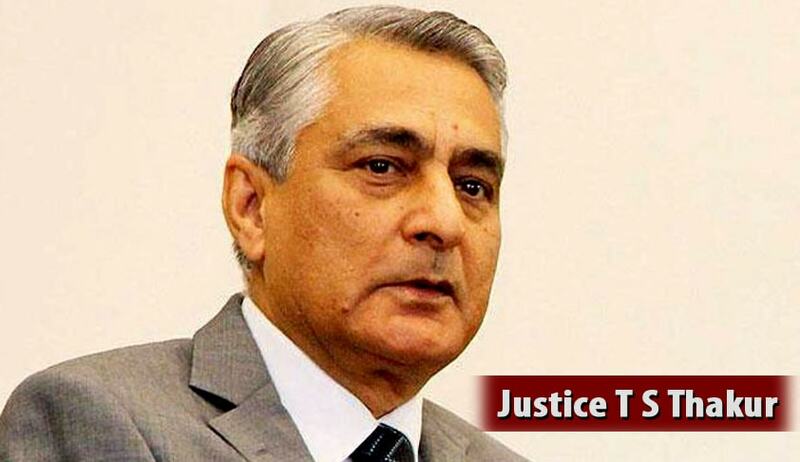 On whether the judiciary was 'okay' with the text of the memorandum, Justice Thakur said the core of the document, based on a Supreme Court judgment, will remain unaltered that the collegium will make a recommendation. Things like the number of judgments a candidate has delivered are contributory in nature, he said, adding that judiciary is ready for the new document. We have no problems. A day before Holi, the file relating to the draft MoP was sent to the CJI. While delivering its verdict on ways to make the collegium system more transparent, the apex court had asked the government to rework the MoP in consultation with the states and high courts. The CJI said the collegium has now cleared all proposals sent to it in six weeks. While 145 judges were either elevated as permanent judges in the high courts or were appointed as additional judges, 169 proposals were still pending with the government, he said. He wondered why the government was delaying the appointment of judges when there was a huge backlog of cases.